A four year-old patient who was diagnosed with regional odontodysplasia was referred to our clinic after the removal of the upper left second primary molar (WHO-tooth 65) due to abscess formation in August 2011. Over the next thirty-four months, remaining root fragments were removed in the area of tooth 65, the upper left second primary molar. At age eight, he presented with exfoliating pain in his lower right primary canine. At this appointment, the area of diagnosed regional odontodysplasia was radiographed and a “ghost tooth” was identified adjacent to tooth 26 where the primary tooth had been extracted and the shadow of a developing second bicuspid was observed on the radiograph. 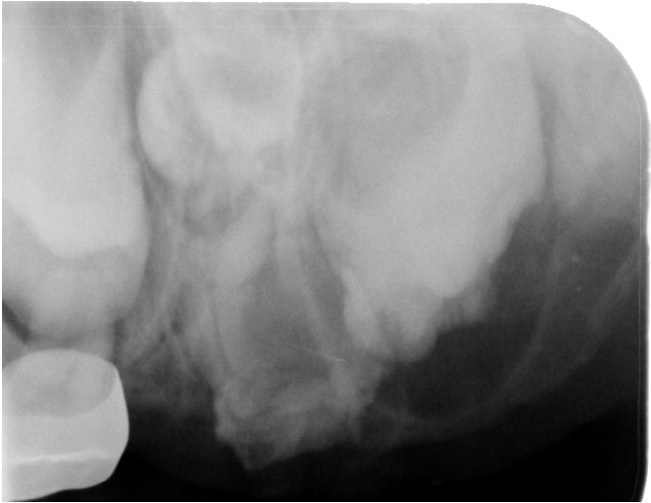 The unusual appearance of an odontoplastic tooth where a primary second molar was removed along with a developing first and second bicuspid presented a diagnostic quandary. The treatment options were evaluated and considered in view of this unusual occurrence and continued observations are being made to determine the fate of the developing condition. The multiple options and difficulties of regional odontodysplasia and teeth removal play a major role in treatment planning decision making. Treatment is based upon presenting circumstances not on a routine protocol. Regional odontodysplasia is a rare localized developmental disorder of dental origin which affects the primary and permanent dentition in early childhood. The cases are diagnosed by clinical, radiographic and symptomatic presentations about the time of expected eruption of the primary tooth. The condition affects the primary and permanent dentition with adverse effects on the formation of enamel, dentin and pulp . Pulpal connections from the surface of the tooth sometimes occurs due to the irregular, thin surface of the enamel. Crawford attributed the description of a “developmental anomaly” to Hitchin in 1934 and since then, its name has been modified several times, by Zegarelli et al., as “odontodysplasia” and by Pindborg, who prefixed it as “regional” to accurately depict the localized nature of its presentation [1-4]. In some cases, it can occur generalized; however, it is typically limited to one arch, generally affects several teeth sequentially in one arch and rarely crosses the midline. The favored arch is the maxilla (usually anterior) with the left quadrant as the most common. In June, 2015 it was reported by Alotaibi that 176 cases have been reported in the literature . The treatment planning for such patients is circumstantial and no routine protocol is established. When cases of this complexity occur, it is essential that consistency of care provider be maintained so that misinformation, as in this case, does not increase the treatment planning and continuity of case management. This case report demonstrates the difficulty of treating such cases, the diagnostic dilemmas of developing teeth which confuse the treatment and the duration of follow-up to conclude the outcome in a growing child. The cases are often diagnosed when affected teeth become infected, or fail to erupt on time resulting in parental complaints of missing teeth. When teeth do erupt they appear discolored as brown/yellow, mottled structures of abnormal morphology, malformed enamel contour with pitting, and swelling of the alveolus. Enamel appears hypoplastic, and hypocalcified, dentin is also hypoplastic and reduced in thickness with interglobular dentin and decreased dentinal tubules and cementum may or may not be affected and if so, may be thinner . Although many etiologies have been suggested such as vascular disturbances, there is no clear cut explanation as to the etiology . The affected teeth, when erupted, are very susceptible to bacterial adhesion because of the irregular surface characteristics and thus caries ensues. The irregular enamel surface is unaesthetic in color and character, and the tendency for pulpal involvement is considerable due to the thin layers of enamel and dentin. Radiographically, the teeth may be seen with irregular contour, thin enamel and dentin layers, short roots and huge pulp chambers with calcifications . Although the appearance and radiographic films detect an anomalous condition, these structures do not represent a pathological threat to the patient’s overall health and oral treatment is based upon clinical conditions, not on a standardized protocol [5-8]. Some have suggested that the teeth be removed followed by a dental prosthesis to prevent “supereruption” of the opposing dentition  and others have suggested delay of affected teeth removal to allow development of the alveolus for later implants. Erupted teeth may have to be restored so that esthetics and integrity of the teeth may be maintained . Cahuana utilized a modified acrylic appliance to prevent over-eruption of the opposing dentition during development . In addition, he considered and performed auto transplantation of bicuspids to replace the extracted dysplastic teeth in a crowded dentition. The treatment selection depends largely on the presenting situation and determining what is best for the child at that time with consistent follow-up so that modifications to the treatment plan can respond to changing conditions. The following is a complex case progression of an 8 year old that presented to the UT School of Dentistry at Houston Pediatric Dental clinic in November 2015 with a chief complaint of a “hurting lower tooth”. 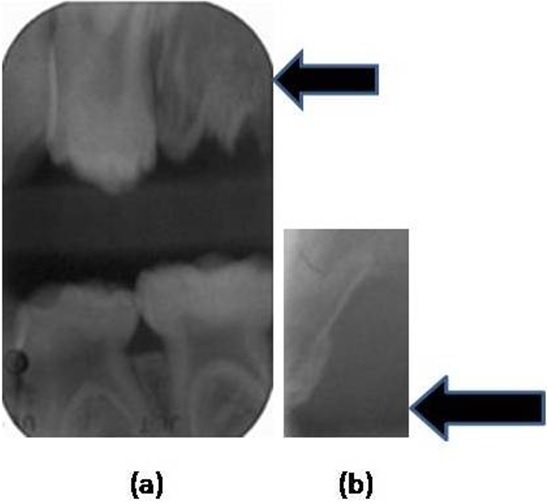 An oral evaluation found that the child was experiencing pain from tooth 83 (the lower right primary canine) due to resorption of the primary root by the succedaneous tooth. The treatment involved the removal of the primary tooth and a follow-up examination to treat lower crowding. It was learned during the treatment that the child was very apprehensive from multiple experiences at the dental office from “ghost teeth” that was diagnosed four years prior. The mother expressed that the child had the ghost tooth removed “three times previously”. 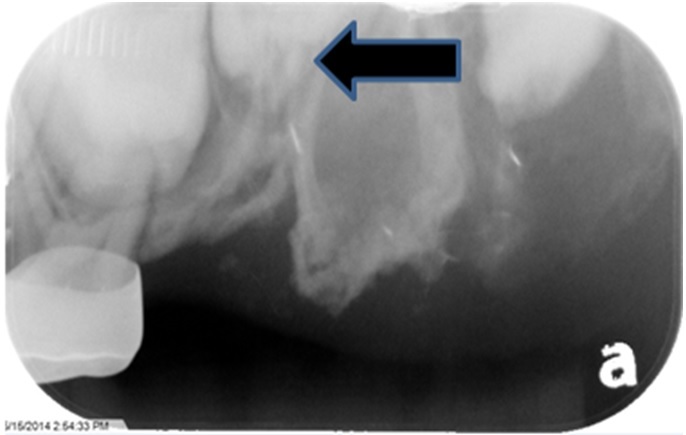 When radiographs were taken for the chief complaint, an additional radiograph was taken of the enlarged upper left alveolus where the “ghost” tooth was located (Figure 1). The appearance of the odontoplastic tooth was typical in appearance to others reported exhibiting a large pulp chamber with thin enamel and dentinal walls, a hypoplastic morphology and truncated roots. The results showed an upper left first primary molar with erupting first bicuspid, an unidentified erupting developing tooth (possibly tooth 25), the odontodysplastic “ghost” tooth and the erupting malformed first permanent molar. The clinical history revealed that the patient first presented to our clinic as a referral from a local clinician with a recent history of removal of the upper left second primary molar (65) due to abscess (Figure 2). It can be seen that the tooth 65 ( the upper left second primary molar) and the Figure 2a, the second image although revealed the offending tooth and root 65 that was hypoplastic with a large pulp chamber consistent with regional odontodysplasia. The history revealed that the referring dentist had removed the offending tooth and remaining root fragments were present, although thin and not well formed (Figure 3). This patient’s progression on the Panograph (Figure 5) shows how changing circumstances can affect the treatment plans of these children and pose treatment dilemmas for the clinician. In this case, it was very difficult to visualize and locate all remaining tooth fragments because of the comminuted condition of the primary root which resulted in discomfort to the patient causing several extractions. The lack of inflammation, infection and tooth presence complicates the future of this child’s dentition. The development of the alveolus is essential if a second bicuspid develops and if the tooth bud of the second bicuspid is used or the affected odontoplastic tooth is removed and an implant considered in the future. In addition, the child is very apprehensive and lacks cooperative ability to withstand complex dental procedures needed to restore the compromised tooth. Unless the behavior improves, the likelihood of multiple hospitalizations for treatment may occur. The parent of this patient has misunderstood the developmental issues associated with this condition and has erroneously described the removal of the tooth multiple times, confusing the clinician as to the treatment plan. There exists, in this patient, the possibility that a developing second bicuspid, mesial to the faulty tooth, be used, if continued and proper development occurs. 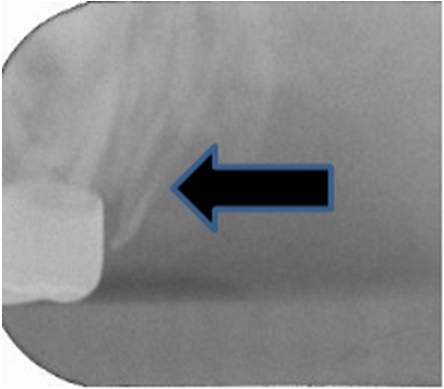 The radiograph in November 2015 shows that the tooth has compromised tooth morphology and therefore may not be appropriate to preserve, although its conformation appears to be more compatible than the existing malformed odontoplastic tooth. The location of the “ghost” tooth compromises the proper development of the second bicuspid by constricting its space (Figure 6 and 7). If removal of the hypoplastic tooth disturbs the developing tooth then perhaps both teeth would be lost. Or, should decision of the fate of the hypoplastic tooth be delayed until more of the calcifying tooth number (25) be revealed? In Cho’s case, he was able to restore the enamel of the hypoplastic bicuspids and speculated that the restored teeth would have to be extracted in the future when skeletal growth is completed due to the poorly developed coronal and radicular structures . Cahauna used a prosthetic appliance to restore the space after extraction of the affected odontoplastic teeth and to prevent overeruption of the opposing dentition. This could be an option for this patient; however, the continued development of the alveolus and its width would be important for a future implant should the development of the second biscuspid not evolve. There is no universal method of treating these patients and as one who follows the progression of the situation; it becomes apparent that multiple conditions permit modifications to the treatment to enhance the outcome. 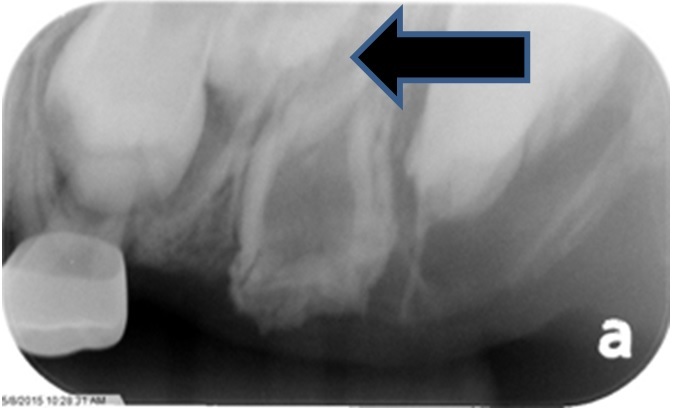 Crawford and Aldred, 1989, described many of the alterations of the tooth structure which can be seen in our case . The developing adjacent first permanent molar also exhibits and enlarged eruption follicle and malformation of the permanent tooth. The developing tooth mesial to the dysplastic tooth appears to have a follicle typical of the second bicuspid and not well calcified as might be expected of an eight year old (Figure 7). It appears to be dysplastic and unsuitable for future use. In Crawford’s case, the patient was diagnosed at age 26 and no complications were noted by the prolonged retention of the dysplastic tooth and the only risk seemed to be that of root infection but was outweighed by the restorative options associated with its retention . Therefore, this odontoplastic tooth could be retained for an extended time to help determine the viability of the odontoplastic tooth as well as the development of the bicuspid tooth. 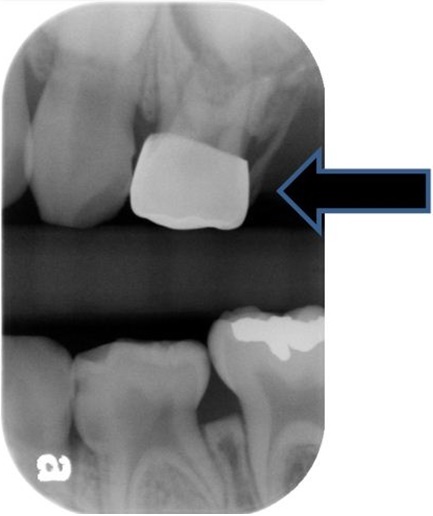 The unusual occurrence of the odontoplastic tooth where a primary molar had been removed and also the radiographic images of the developing first and second molars complicate the treatment planning (Figure 8). In the case reported by Hamdan et al., in 2004, the affected teeth were the lower incisors and canines which crossed the midline. The incisors were enucleated and the canines preserved with their future to be determined as they develop. In the meanwhile, he made a denture for the lower anterior incisors to preserve the alveolar ridge during development . In the case reported by Cho, in 2006, the ten year old had teeth 11, 14, 15, affected and once erupted, were restored using composite resin and served until age 14.5 years with enlarged pulp chambers . Magalhães et al., reported a five year old with presumably affected left primary first and second molars were missing as well as the primary right central incisor. In this situation, the removed teeth were restored with prosthesis and the permanent affected teeth in the upper left quadrant were observed for proper development . The case reported here, in its development, has the potential to have teeth restored or removed, if a permanent bicuspid continues to calcify. The addition of prosthesis to the plan may have to be utilized until the developing bicuspid (12) occurs or retention of the malformed dysplastic tooth to be restored as needed. This case progression will be followed to determine what is best for the patient. The progression of this case presents a dynamic clinical challenge which requires continuous monitoring as development occurs. The multiple clinical choices must be considered so as to preserve as much bone, tooth structure and contour for the “normalization” of the dentition. This case presents many challenges for the clinician to consider and as development occurs the dynamic changes force the clinician to consider alterations to the treatment plan to provide an acceptable outcome. There are no conflicts of interest associated with this manuscript. Crawford PJ, Aldred MJ (1989) Regional odontodysplasia: a bibliography. J Oral Pathol Med 18: 251-263. Hitchin AD (1934) Unerupted deciduous teeth in youth aged 15 1/2. Br Dent J 56: 744-750. Zegarelli EV, Kutscher AH, Applebaum E, Archard HO (1963) Odontodysplasia. Oral Surg Oral Med Oral Pathol 16: 187-193. Pindborg JJ (1970) Pathology of the dental hard tissues. Copenhagen Munksgaard, Copenhagen, Denmark. Alotaibi ON (2015) Regional odontodysplasia: An overview. Pakistan Oral & Dental Journal 35: 175-178. Hamdan MA, Sawair FA, Rajab LD, Hamdan AM, Al-Omari IK (2004) Regional odontodysplasia: a review of the literature and report of a case. Int J Paediatr Dent 14: 363-370. Cahuana A, González Y, Palma C (2005) Clinical management of regional odontodysplasia. Pediatr Dent 27: 34-39. Cho SY (2006) Conservative management of regional odontodysplasia: case report. J Can Dent Assoc 72: 735-738. Magalhães AC, Pessan JP, Cunha RF, Delbem AC (2007) Regional odontodysplasia: case report. J Appl Oral Sci 15: 465-469. Figure 1: Odontodysplastic tooth with perm. Tooth 26 and developing second bicuspid (arrow) (November 2015). Figure 2: a) Primary tooth 65 (August 2011), b) Primary tooth 65 (August 2011). Figure 3: Remaining root fragment (February 2012). Figure 4: Remaining root fragment (November 2012). Figure 5: Progression on the Panograph (September 2013). Figure 6: Developing Maxillary 2nd Bicuspid (May 2015). Figure 7: Developing tooth (November 2015). Figure 8: Developing first, second bicuspids, perm. First and Second molars (December 2015). Citation: Badger GR (2016) Regional Odontodysplasia - An Unusual Development. J Dent Oral Health Cosmesis 1: 001.